We were delighted to host our first ever Wasatch Photonics spectroscopy intern over the summer of 2018. Hazel Stewart, a PhD student from the University of Strathclyde, Scotland spent 10 weeks at our Durham, NC site measuring everything she could get her hands on, as well as performing characterization testing on our products (see the new launches at SciX!). Internships give students exposure to jobs they may never have realized exist outside in academic environment – jobs like product, test, process, or application engineer. All of these positions require a high level of technical knowledge while making a direct impact on product development, manufacturing, and research divisions within a company. During her time at Wasatch Photonics, Hazel was a key contributor to product characterization, interim product testing for OEM development projects, and in taking applications data. In fact, you’ll see some of her measurements on saffron, carbon nanotubes, oils, sugars, and fluorescence in other application notes. At the end of it all, we sat down with Hazel to find out a little more about the experience, and how it will influence her in the last year of her PhD and her career to follow. Can you tell me a little about the CDT Optima program and their mandate? Hazel: OPTIMA is a four-year PhD programme at the Universities of Strathclyde and Edinburgh that looks to bring together students and supervisors with different scientific backgrounds to work on interdisciplinary projects. The programme also includes an integrated business course so that students are not only experienced in research, but also have a good knowledge of healthcare innovation as well as an awareness of how to commercialise healthcare technology. What made you choose that program over a more traditional PhD? 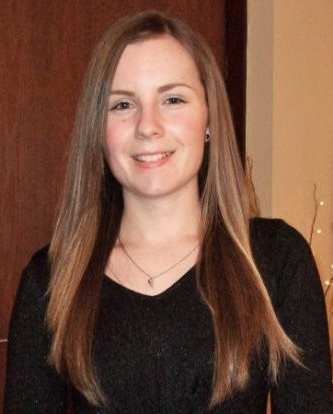 Hazel: The interdisciplinary nature of the projects appealed to me, as I was keen to apply my knowledge and experience in fluorescence to interesting biology and healthcare research, which in turn allows me to develop my knowledge in these other areas. The opportunity to undertake a placement was also a big bonus for me, as it gave me the chance to experience an industry I was interested in working in after the PhD. What did you learn about the equipment and products from this hands-on experience compared to working with equipment in a research lab? Fluorescence system using a WP VIS-NIR, standalone cuvette holder, and laser excitation. Hazel: Even though I already knew the instruments were compact before I arrived, I don’t think I realised just how much smaller they would be compared to the benchtop instruments in our own lab! 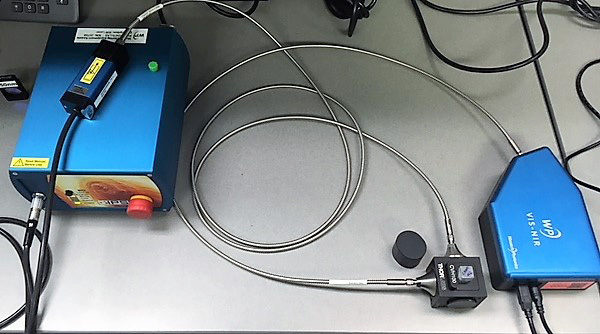 Being able to plug in a spectrometer to any laptop and acquire spectra within seconds is a completely different experience from the research lab as well, and it’s interesting to think of the potential of such equipment for ‘in the field’ applications. Was working for a company what you expected? How did it differ from your PhD? Hazel: I don’t think I realised how quickly the projects I was working on could evolve depending on what was needed at the time and initial results, as well as how much more we would explore beyond the original internship plan! I think it was good that it didn’t follow a rigid plan though, since it gave me a much more realistic experience of working in a company, where the turnaround for projects is much quicker than what I’m used to in the PhD. Was there an experiment or sample series you found particularly interesting? 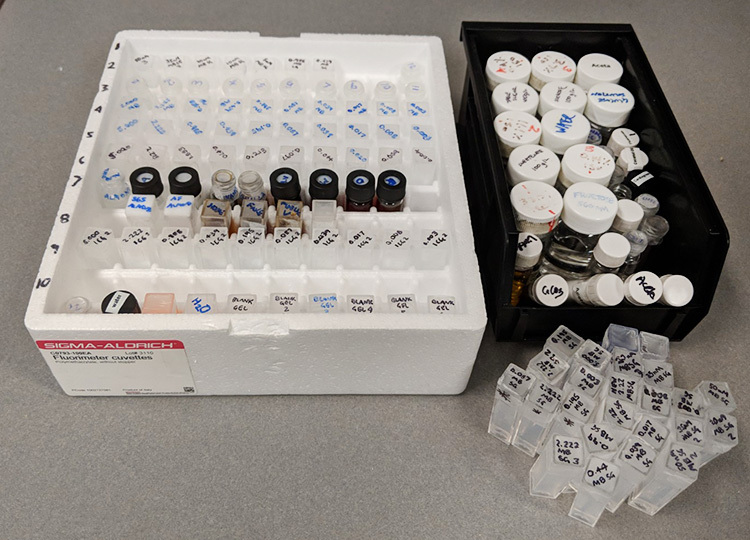 Hazel’s many samples, tested using Raman, UV-VIS absorbance, and fluorescence. Hazel: Working with the Raman instruments was interesting for me, as I haven’t really had any experience with Raman measurements before working at Wasatch Photonics. Measuring the spectra of everyday samples such as the different oils and sugars, and how the different wavelengths of light can change the spectra was interesting to learn about. I’m glad to have taken that excitation wavelength vs Raman spectra data on so many different sample types so that it can be shared with others working in Raman. Were you able to relate your internship activities to your own research? Hazel: Working with the absorbance and fluorescence instruments during the placement has been beneficial to my project work – performing characteristic measurements and troubleshooting has given me a greater appreciation of how these instruments work and how I can improve my own measurements back in my university labs. How will you look at your own work differently having had this experience? Hazel: After performing various characteristic measurements at Wasatch Photonics I think it’ll be important to keep in mind in my own experiments all the experimental factors that could be affecting measurements that I wouldn’t have questioned beforehand, e.g., choice of cuvette, light source, fibers etc., as well as how important the precision of sample preparation can be! What advice would you give to students looking to seeking to set up their own internship? Hazel: Start researching the area/companies you’re interested in early and organise the placement as early as possible! I was lucky to set up the internship at Wasatch Photonics rather last minute after my initial one fell through, and it was stressful ensuring I had the visa and other documents I needed in time for the start of the placement. It’s a really great opportunity to undertake an internship, so be sure to make the most of it and try choose both a company and location you’re interested in. Wasatch Photonics ended up being a really good match for my interests in hands-on measurement, so it worked out really well in the end. Proof that spectroscopy is fun! 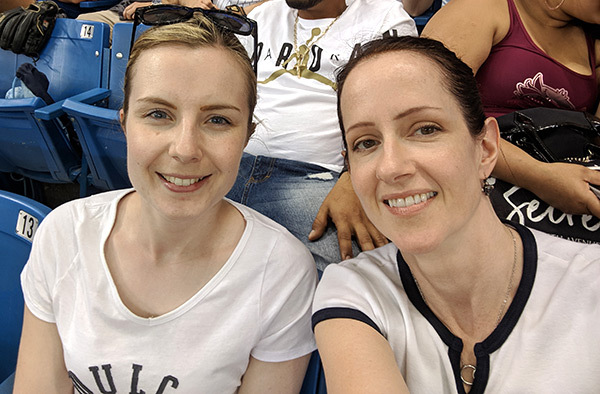 Hazel Stewart, WP Intern and Cicely Rathmell, VP Marketing at an MLB baseball game (Yankees won!). What is your ultimate takeaway from the experience? Hazel: Working at Wasatch Photonics has really helped me focus my interests in terms of career path for after the PhD, and I’m very grateful for being given the opportunity to work there this summer. Learn more about the CDT Optima program.